Bruno was a pioneer in the field of child psychology - his most acclaimed work 'The Uses of Enchantment' (1976) details the importance of folk and fairy tales for the emotional growth of children. He argued that darkest and most sinister tales allow children to work through their fears in an abstract, symbolic way. Bruno was widely celebrated as a gentle and inspired teacher and practitioner, assisting many disturbed children throughout his career, but shortly following his tragic suicide claims were made that he was abusive and tyrannical. A multi-faceted gentleman with an eventful history, in this representation I have focused on Bruno's affection for the unknown and sinister - recognising that dark places hold answers and assurances for our deepest troubles. Think carefully before you let this wild but gentle beast out of his enclosure ~ he will only bite a little bit. 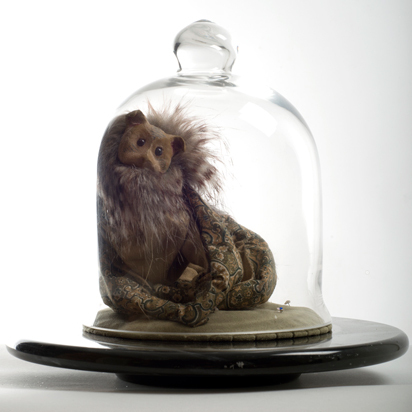 Bruno is eminintly pose-able, and happy to travel on your arm or shoulder, or sit quietly in his glass dome. 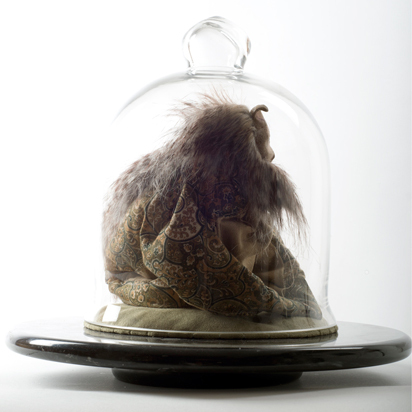 He was brought into being with a combination of the following materials: aluminium armature, wadding, sculpey, glass beads, fabric, fake fur, flocking.